A couple more days of fun in the sun for you to get a chance to splash around in the water! 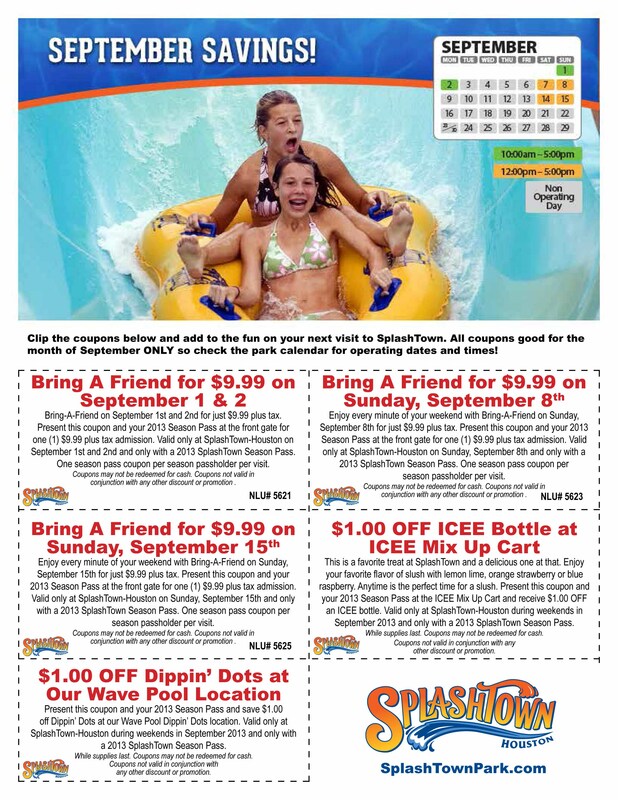 You can enjoy the last days of summer with these MULTIDISCOUNT SPLASHTOWN PARK COUPONS. That’s right. The month of September is loaded with a variety of coupons that can help you cool off naturally instead of braving the elements. You can’t deny the fun and frolicking that takes place when you have family and friends for such a good time at a water park. 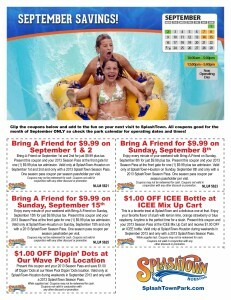 Every weekend in September promises a coupon for you to enjoy. They even have ICEE and Dippin Dots goodies for you. Get on the phone, make some plans and get your last days of summer in! If you’re a college student, this is a good ice-breaker for you and your dorm buddies to get acquainted, or a great outing for your fraternity or sorority. Families can’t have it any better. You get the best of both worlds – time with the family AND great fun in the water. Who needs the real ocean? This will definitely do. And for those who don’t want to get in the water, there are a number of things that you can do as well. You don’t have to be bored. You’d be surprised at the fun you can have and don’t have to hit the water. They plan amusement parks to accommodate everyone so you will still have a bunch of fun. It’s scorching right now in Houston, Texas but you know that won’t last for very long. The weather is consistently changing year after year and you don’t know what one day will bring from the next. Get your coupons and have some fun! You’ll be happy you did.